The guard stopped, brow furrowed, and emphasized, "I really hope you have a little man in your bag." At that point I realized she was referring to the Librarian Action Figure, which I immediately yanked out and handed to her with a flourish. She roared with laughter and waved the doll in front of her colleagues; they all "shushed" for a minute, faces wreathed in smiles. I admit it--it was a proud moment. Some of you get your noses out of joint because we are perpetuating the stereotype of the friendly if nerdy reading advocate. Frankly, show me the airport security guards who think it's fun or complimentary to imitate trial lawyers or dermatologists. We're going to need all the LAFs we can get in the next few months. With the elimination of the vehicle tax, California librarians need to get creative el pronto about advocating for better funding, or frankly, we're hosed. Stop worrying about our Books in the City personae, and figure out how to turn our very good public perception into serious dollars and cents. First, committees need more than an hour to meet. We barely got through introductions before the meeting time was over. We may have to self-start this issue ourselves next year, by intentionally choosing to meet longer and/or at a different time than the one-hour slot, but the point is very well taken. In a late-morning rescue action, Roberto Esteves and I tracked down and released the Librarian Action Figure and her display case from where she had been held in captivity in a nearby booth. Thanks to all of you who shared your concern and support with us during this difficult period. 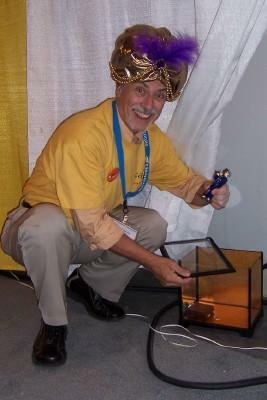 A display case featuring the Librarian Action Figure, which Califa is selling at a discount, was stolen overnight from the Califa booth (502) at the CLA convention. How pathetic can you get? If you have any information about this theft, post a comment or write me privately at kgs [at] bluehighways.com. If you are the hard-hearted person who did this dastardly deed, please just leave the display case somewhere near the lobby of the Marriott. Have something to say about David Brin? I'm introducing him as a speaker at the Sunday, November 16 membership meeting at our annual state conference. Then, naturally, I googled him to find his official Web site, which includes an impressive (and very California-flavored) bio. I'm already liking the guy. He's as nervous about blogging as I am. It feels like literary barebacking (oh dear--did I say that in public?). But I'm a little worried, because the talk is just over a week away and I've only read Postman. This guy is no one-trick pony; he must have titanium arms, because he's been flailing at keyboards for over two decades. Oh, hey, he's written a lot of short fiction. I know! I'll read a couple of stories and spice up my intro with a well-placed reference or two. Back to Google... and then, on to the value-added databases! Wonder if a trip to Bancroft would be worth it?